A Welsh photographer who came to Spain around 1850 to work as an illustrator in El Museo Universal, a periodic publication that used his pictures as bases for future engravings. In 1858 he started to work in the service of her majesty Isabel II, travelling with her to various places in Spain and making very interesting and important photographic reports. 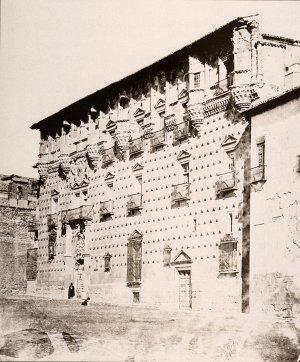 In 1856, he arrived to Guadalajara while he was making a photographic trip organized by the duke of Osuna who wanted to have a picture collection of his palaces in Madrid and Guadalajara. It was then when he shot his pictures (ten) of the Infantado palace. Between 1851 and 1858, he made another report in Madrid and Guadalajara about the construction of the Pontón de la Oliva dam and other engineering works in the Isabel II Canal.